This past year, 18 Kindergarteners entered my classroom with vastly different levels of knowledge. Some of my students had preschool experiences, while others experienced their very first day of school when they walked into my class. Some students were raised with English as their first language while others entered knowing not more than a few English words. Regardless of factors like language proficiency or preschool experience, writing remains one of the most challenging subjects for many of my young scholars. It requires a tremendous number of prerequisite skills such as letter memory, phonics, and fine motor skills. It also draws on social-emotional competencies such as stamina and motivation. With all of these factors at play, writing seemed like fertile ground for a rich Mills Teacher Scholars inquiry. I hoped that through a focus on writing I could support my students to feel confident using writing as an avenue to express themselves, tell stories, fight for justice, and be leaders in their communities. In my previous two years of teaching, I taught first and third grade at an international school in Beijing. My first-grade students in Beijing entered my classroom knowing how to draw and label their stories. Therefore, I expected a similar level of proficiency in my Kindergarteners. By the end of the year, my goal was for my Kindergarteners to become independent writers who felt empowered to trust their knowledge and skills. In starting my inquiry, I offered my students a checklist to help them revise and edit their writing. 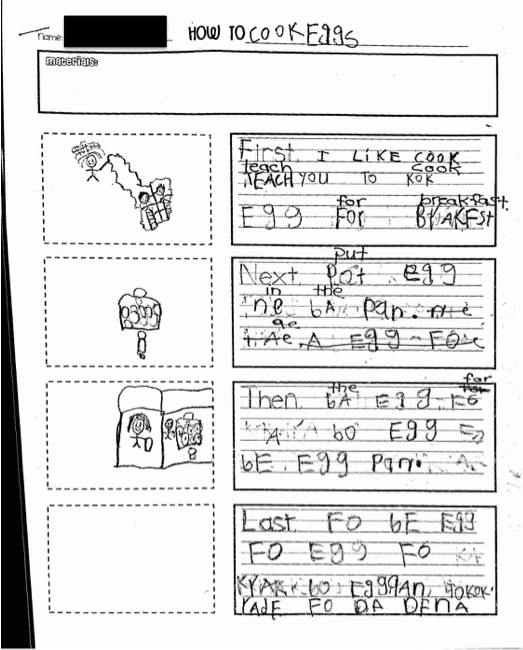 The checklist was Kindergarten friendly – with pictures rather than text – so students of all reading levels could access it. I modeled how to apply the checklist to a student’s writing, and then students practiced with the checklist while I walked around to help those who needed more support. I assumed that after I modeled the checklist, my Kindergarteners would be able to use it to include every expected element in their writing. I quickly found out that I needed to readjust my expectations for my new context. This would be a marathon rather than a sprint. Every month when I met with my Mills Teacher Scholars inquiry team and shared my students’ work with my colleagues, I had a lot of worries. I had high expectations, but my students were clearly not meeting them yet. During a Mills Teacher Scholars inquiry session, a colleague asked me a powerful question, “Where are your current students at now?” This question helped me realize that while my original inquiry focused on the latter part of the writing process, many of my young writers still needed practice with earlier stages of the process like labeling, writing sentences, and conventions. Through student work analysis and strategic questioning, my colleagues helped me understand that I needed to attend to prerequisite skills before I could target the checklist. Finally, the light bulb turned on: I needed to take the time to focus on my Kindergarteners’ current writing needs rather than basing my instruction on assumptions from a previous class. Although I was anxious about changing the course of my plans, I did not want to be a teacher who merely teaches the curriculum, only to leave half of my students behind. I wanted to ensure that all of my students were able to access the curriculum and feel empowered in their writing skills. Where are my students in the writing progression? How can I support their individual needs so that they can meet the learning goal of becoming independent, empowered writers? Drawing stage: These students could verbally tell and draw their stories, but needed more practice with labeling their drawings. Labeling stage: These students could verbally tell, draw, and label their stories, but needed more practice with writing sentences. Sentence stage: These students could verbally tell, draw, label, and write sentences, but needed more practice with conventions such as capital letters and end marks. With the support of my colleagues, I designed adaptations to the writing curriculum that met each of these groups of students where they were in their writing development. 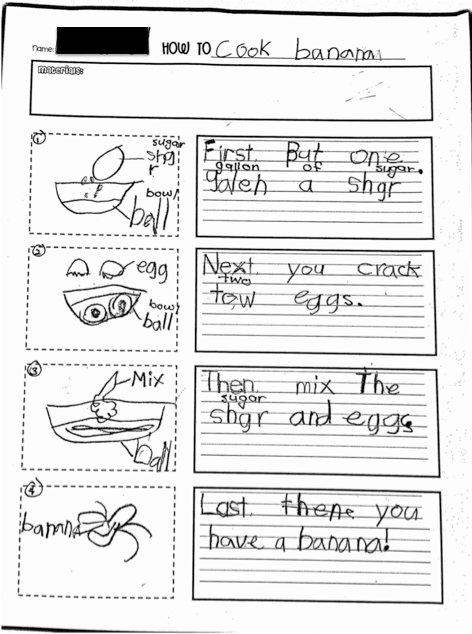 For example, many of my students in the drawing stage were intimidated by the three-page booklet that the curriculum suggested we use to begin the “How-To Writing” unit. 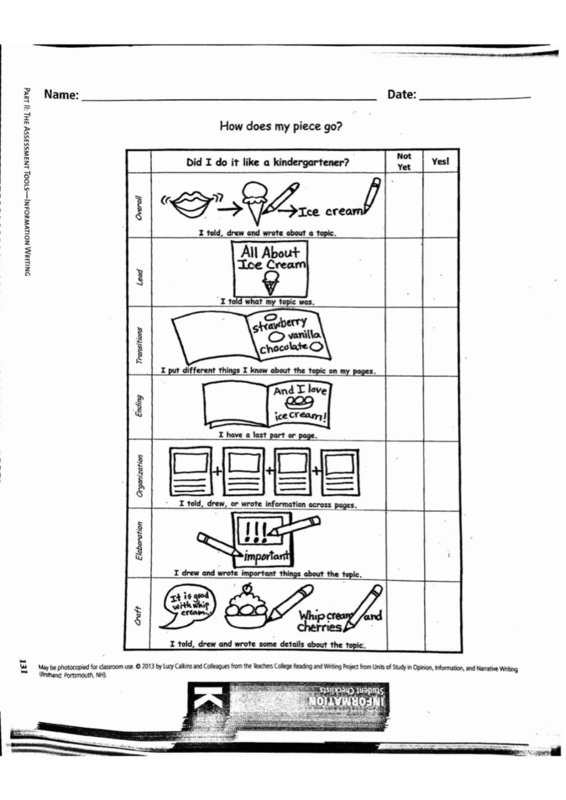 I adapted the curriculum to include a planning page prior to the booklet. I observed that my students felt less timid starting with a one-page plan. In fact, Abe, my focal student, who usually scribbles all over his page, was this time able to label his drawings. At clean up time he eagerly showed me his progress, smiling ear to ear. To jump start my “labeling stage” students’ confidence in writing sentences, I used a highlighter to take dictation for their first page, which they then traced over. This gave them the confidence to try to write sentences on their own for the following pages. For my sentence-writing students, I used 1:1 conferencing to focus on written conventions such as spelling, capitals, and end marks, and to make sure that those edits made it into their final drafts. As I tended to my students’ specific needs throughout the process, they became more confident and motivated to write. By the end of the unit, all of my students had produced a three-page booklet, which they then used our checklist to revise and edit. In their newfound confidence, they wanted their writing to become even better. As a teacher, I feel incredible urgency to ensure that my students acquire the content and skills necessary for success. Through this writing inquiry I was able to cross the finish line with a new perspective. I realized that for my students to achieve our goals, I needed to look at each of them through the lens of their specific needs. Just like runners at different paces, my students learn at different strides. From this experience I am reminded that achieving worthy goals requires time to reflect, analyze, and adjust plans accordingly. I am proud of my students for giving their utmost effort to cross the finish line with me through this writing process. 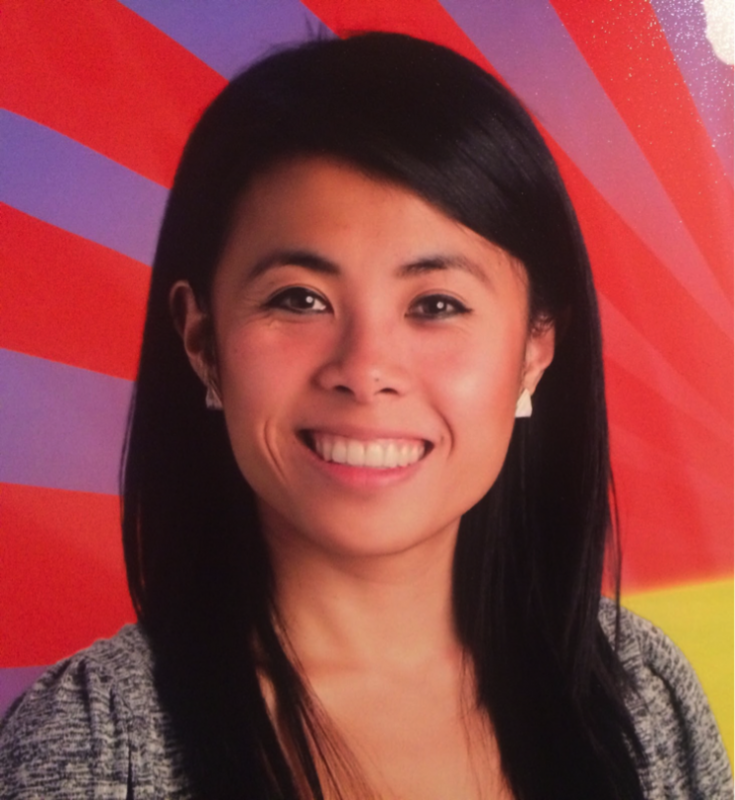 Anna Tom is a Kindergarten teacher at Anna Yates Elementary School in Emery Unified School District. She is one of the coaches for Girls On the Run program at school. She received her teaching credential and M.A. in Education from UC San Diego’s Education Studies Department. After this inquiry, Anna became more curious about Kindergarten writing. In July, she decided to extend her Mills Teacher Scholars writing inquiry into a research curriculum unit for Kindergarten writing. The unit focuses on art and writing, including research on the drawing and writing progression from ages 1-5, and parallels between Chinese pictographs, Egyptian hieroglyphs, and Latin Alphabet with Kindergarten writing. A colleague asked me a powerful question, “Where are your current students at now?” This question helped me realize that I needed to focus on my Kindergarteners’ current writing needs rather than basing my instruction on assumptions from a previous class.